Over the past 8 years I had fostered close to 80 young, old, huge, tiny, unkempt, pampered, terrified, aggressive and completely neglected dogs. Only twice I was asked to take in a dog in need of regular medical treatments. 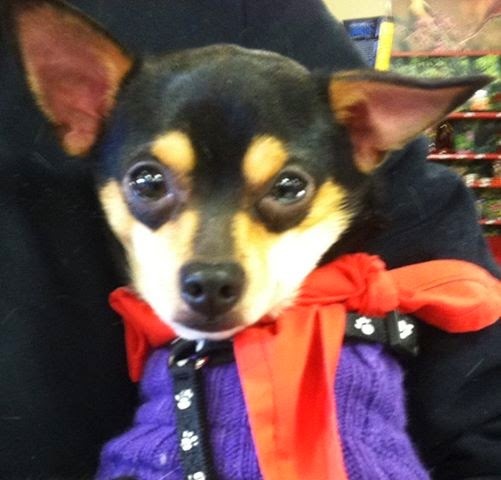 Meet Spyke, leggy, adorable, one year-old Chihuahua mix. Somehow in his short lifespan, he’s had a misfortune of breaking his front paw in the most inopportune place - his “wrist”. Dogs essentially walk on their tip-toes, so this is the worst kind of injury since they constantly apply the weight on the trying to heal bone. So, similar to horses, many dogs never fully recover full use of their limbs. I received an urgent text message from my foster coordinator in November, asking if I could take in a dog who’ll need weekly cold laser therapy treatments at the nearby animal hospital. Not knowing a thing about laser therapy, much less that it comes in cold or hot varieties, I agreed to do it as a trial run. Picking the little guy up at the following adoption event from his previous foster, I got a crash course in dog leg injuries. Spyke came to HART from West Virginia, where his owners dropped him at the shelter with an already dangling front paw. Taking pity on a friendly guy, shelter's vet tech stabilized it and called several rescues. Since HART works with a variety of veterinarians who can perform complicated surgeries, little Spyke got a second chance at life. First surgery went well. To “set” his leg, the doctor inserted a pin at the site of the break to fuse his broken bone. 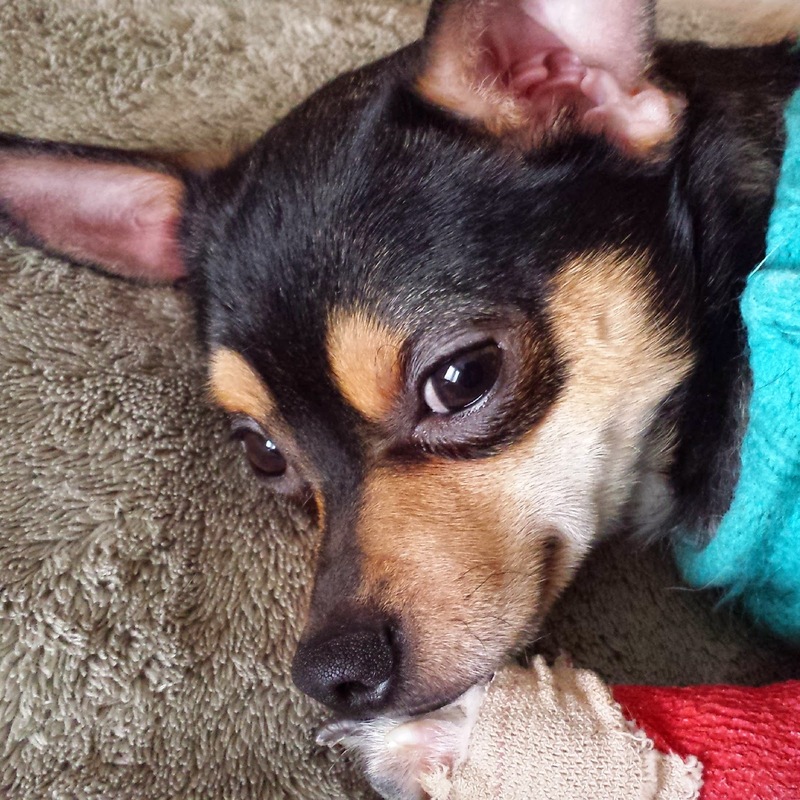 With his cast fitted and his foster elated to have him, Spyke found his new life of convalescing rather appealing. Living in a house with large fosters (think Labradors and Huskies) he quickly learned to avoid them altogether by riding in the arms of his foster parent anywhere he pleased. With his leg healing and his cast removal a week away, the rescue lined up several interested families for Spyke to meet soon after. That is when the accidental re-break changed all that. As Spyke inadvertently leapt off a couch, it took less than a split second to undo months of treatment. The very pin put into his leg to fuse it became the very instrument of destruction as it dislodged and went right out of his paw. A short while later I received that text asking me to take him because of my proximity to the animal hospital that performed alternative treatments. Once I took him there for his second successful surgery, it was confirmed that in addition to putting his leg together (this time without any pins), he’ll also need what is known as laser therapy. Turns out cold laser treatments are designed to heal the soft tissue around the broken bone, allowing the body to focus on re-building the actual bone matter. Having now become the second person to carry Spyke everywhere he pleased, I began his weekly routine of seeing his vet and the parade of vet techs who examined, x-rayed and re-bandaged his leg with bright colors any child would be jealous of. Broken legs take a long time to heal. With months going by, each treatment got us closer to the day, when his soft cast was to be removed. It finally happened in the late February, but his freedom came with a huge warning not to let him jump off of anything, be it lap, stairs or furniture. His chance of having a normal life was again becoming reality. But two months later, he was still living with me because people prefer to adopt dogs without recent injuries. Fate works in mysterious ways. Since the removal of the cast, Spyke’s leg looked like a scary toothpick. Unused for over 6 months his muscles had largely atrophied, leading the dog to barely use the leg as he walked. So in order to have him equally distribute the weight and spur muscle strengthening, I considered a partial leg cast. Having gotten rescue’s approval to see the same vet to discuss the possibility of such a thing (btw, it's not yet invented) I serendipitously bumped into one of the vet techs who patiently took care of him back in November. Shocked to see Spyke still available, she and her husband applied to adopt him that very night! Nobody could have imagined a better placement. She knew the extent and nature of his injury and, as it turns out, recently lost a Chihuahua of her own. Chihuahuas tend to attach to one person for life, but, perhaps because of his young age or the love he immediately felt at his new home, 24 hours after his screaming and complaining at my leaving him behind, he was already playing with his new family's pets. Unfortunately, after another month of treatments to try and develop protective cartilage to support his leg bone, the vet and Spyke's new adopters decided to take the troublesome leg off altogether. Not an easy surgery or a heeling period, but three weeks later, the little guy was once again hopping around and a month and a half later started running on his trusty three legs. Just look at the video of him out-racing his friend at some crazy speeds! How was anyone to know that the very leg that got Spyke given up would become the reason he’d find his loving family and a forever home!